Numbers mean nothing without context. In China the numbers are unusually huge, and for anyone with big eyes that looks good, the trick is to look with sharp eyes. Eye Spy with my little eye something that has: massive potential for my music to get utilized and return a healthy income, this is what music distribution in China proposes. 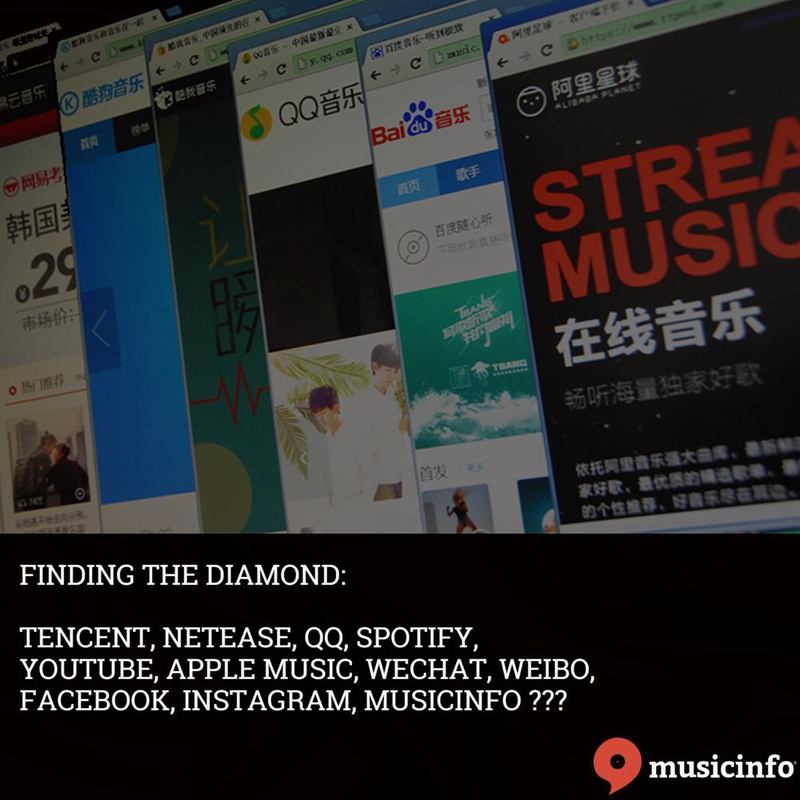 Please use your sharp little eyes to spot the digital music distribution diamond in the rough, not all services that now boast distribution to China are equal. These are more or less the only music distributon channels that are being utilized by the majority of the Western digital music distribution services who amongst their typical worldwide music distribution plan including Asia, throw in China for good measure; they are, Kanjian, K digital, KK Box, or have an exclusive agreements with Tencent or Netease, which means you can get your music on one or the other. What if there was an other choice, someone who could get you into China through the backdoor and distribute your music to all the top major streaming services and minor radio and sound media providers and you keep 100% of the royalties to boot? Umm… Where do you sign up you ask. Musicinfo's digital music distribution gets your music to the largest audience in China hands down, buy distributing your music to all the top major monetizing streaming services and having your music organically promoted to a multitude of significant radio, internet radio and various music media providers. No one else can do this for you all in one shot, and start promotion actions by distributing your video and posting on Chinese social media as well as find your music a life on influential playlists. 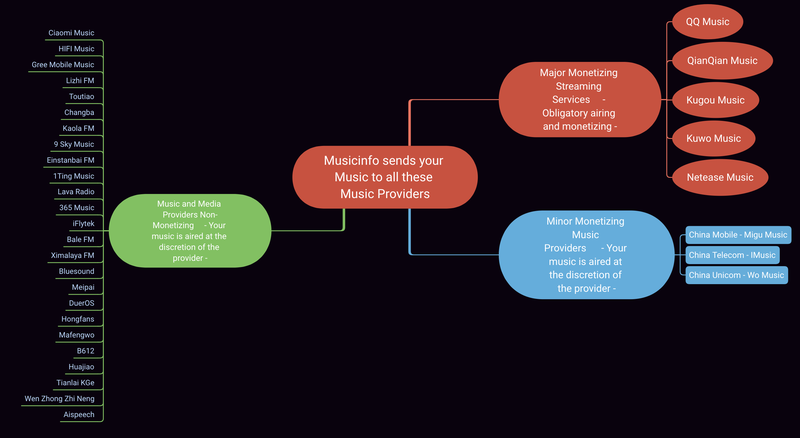 By all means you are welcome to go and do the leg work yourself, and after miles of pounding the digital pavement you may come up with a better strategy to find the best digital music distribution service, but think of all the music you could have been making in the meantime. Trend is the trendy word. The now, the current, is all that is important. What we need to know now and do now will give you the power to be in the game and pave the way to your success. The trend, the hype is music distribution to China and playlists. What that means is if your music is in China you gotta get it on a playlist. You’re then on the right track to get your music heard and generate royalties. This is a good thing that your music is not sitting around on the sidelines waiting quietly waiting for its turn to be put in the rotation. As a thriving musician you have the choice to influence how and who your music gets listened to, but when it comes down to it the real matter is in how many plays it gets. More is better and better is more. The bigger the audiences, the more plays, the more royalties, that’s the logic. The biggest audiences now and the current trend is China. But first you’ve gotta get your music there. Take a comparison, Table 1. of the services that are available inside and outside of China. Note that if you have your music on Spotify, Pandora, Deezer or others it is most likely not in China. Facebook, Instagram, Twitter, Youtube and others are not in China. Take a look at table 2. and see for yourself the strengths and limitations of the top distribution services for you. It is obvious that the logical choice when distributing your music to China is to utilize the service that specializes in China. Experience the most extensive reach to the audiences in China, outlined in table 3., and make Musicinfo your music distribution and promotion expert. No yearly fees. You pay once, your music is up forever no matter what. Physical distribution. They have partnered with Alliance Entertainment, Super D and Amazon to get your CD/record in record stores around the world. You must apply for this feature. Fulfillment and an ecommerce store for CD and vinyl. They have an admin publishing service to collect your songwriter royalties via CD Baby Pro Publishing. One of the few companies to collect your Synch licensing possibilities. No commission. You keep 100% of the revenue. Unlimited songs for one yearly price. Payment splitting. Single page signup. Email every step of the way - upload success, when it appears in Spotify, iTunes, etc. Instagram Story "Music" inclusion. Next day trending reports. You can send lyrics to Apple Music and iTunes. “Leave a Legacy,” for $30/release, the release will never come down “even if you die,”or miss your annual payment. Ability to download the songs. Text message marketing (coming soon). Reports and analytics, very basic information in plain form. $.99/year/release for Shazam. If you distribute an album of 10 songs, it will cost you an additional $10/yr for that album just for Shazam. Lots of extra fees. No admin publishing partner to help collect songwriter royalties. Text message marketing feature has been ‘coming this week’ for months. No commission. You keep 100% of the revenue. Unlimited songs for one yearly price. Reports and analytics reports are very clear and intelligible. Are they accurate? Who knows. No fees. No commission. You keep 100% of the revenue. (except from China). Distribution to Chinese DSPs. Have ‘experts’ who will review your music for $25/song. Can be helpful to get objective feedback. No admin publishing partner to help collect songwriter royalties. No payment splitting. High takedown cost for the first 3 months (if there’s an error with distribution and you need something fixed, it’ll cost you). No commission. ASCAP members get free membership and free distribution. In house playlist pluggers (for artists gaining traction). Free distribution with any mastering membership. Shared workspace. Landr has a collaborative workspace where everyone on the team can work on a track in a centralized location. In house playlist pluggers. 6 different MCNs (Multi-Channel Networks) with 5.5 billion views a month. This helps maximize YouTube revenue. They have video production studios where their artists can shoot videos. Collect YouTube mechanicals in Brazil. Payment splitting. Analytics showcase playlist skip rate (access to detailed Spotify playlist API). Give advances. Tons of Data. Because they have so many bands who have registered so many shows, they have a touring database built up that can help bands find venues of similar size in multiple cities.No commission. You keep 100% of the revenue. Distribution speed - require 3-4 weeks lead time typically. No admin publishing partner to help collect songwriter royalties. 15% commission. Revenue and analytics reports. Not very developed or intelligible. Very difficult to get granular data.Payment splitting is not automatic (you have to email in and request it). Only 5 total outlets: Apple Music / iTunes, Spotify, Amazon, Google Play, Deezer. New and unproven. Lots of missing features that other distributors offer. No admin publishing partner to help collect songwriter royalties. No daily trending reports. No mechanisms in place to help artists who start to catch (marketing support, playlist plugging, etc.) Customer service is not very helpful. Not much pull or connection with the DSPs. They distribute to China and Korea. No commission. You keep 100% of your royalties. Has an admin publishing company which will help track down your songwriter royalties (Tunecore Publishing). Revenue and analytics reports are incredibly clear and very detailed. Daily trending reports (for Apple Music / iTunes and Spotify) Offers advances for future revenue projections.